Carpenter ants are the largest ants (3.4 to 14mm long) most people will ever see in their lifetime. Carpenter ant colonies in the Portland, OR; Vancouver, WA and Camas metro area can be massive, reaching up to 100,000 workers. The two most common species in the Northwest are C. Modoc & C. Vicinus. Both species are primarily nocturnal but can also be active during the day. Most people think of carpenter ants as big and black however they’re “polymorphic,” which means the worker ants vary in size. Carpenter ants can also vary in color with red or yellow hues on their usually black body. Carpenter ants cause more economic damage in the state of Washington than any other state in the U.S. and Oregon isn’t far behind. 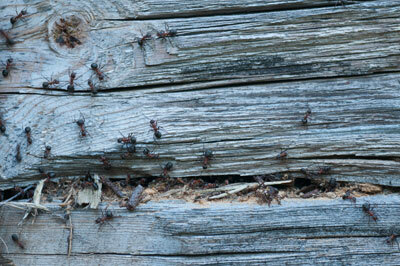 Pacific Northwest carpenter ants can destroy sound or damaged wood. Outdoor nesting sites tend to be inside trees, under stumps and rocks, or in landscape timber. In homes carpenter ants usually nest inside wood and various kinds of insulation. Within the home, the nest (or nests) is almost always a “satellite” colony. The main carpenter ant colony may be up to 250 yards away. Carpenter ants are called “carpenters” for a reason. They do not eat wood for nutrition like termites. Rather they excavate their nests in wood creating smooth galleries and tunnels. The displaced wood is fine like sawdust with insect parts and dead ants usually mixed in. A severe carpenter ant infestation is most often connected to a moisture problem somewhere inside the home. It may not come as a revelation that carpenter ants can be extremely destructive if left untreated. The extent of damage inside a home depends mostly on two things: First, how many carpenter ants there are and second, how long the ants have been active. 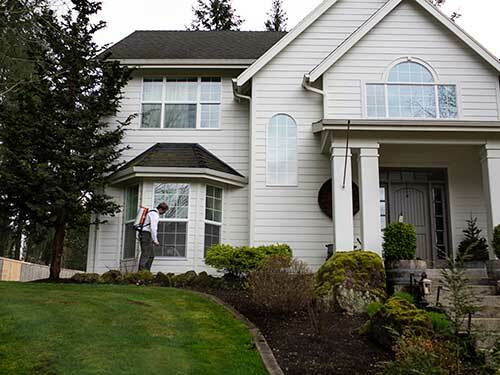 If you notice carpenter ant activity in or around your home, it’s vital to get a professional carpenter ant inspection immediately. Early intervention is critical when dealing with wood destroying organisms.